Wishing for you a Happy Mother's Day with great respect of all you do! No respite for this mama bird, however she is on intense duty for only a few weeks whereas human mamas and papas are on the job for 18 years (and more...). We are all different kinds of mothering styles striving to do our best by our children. On Mother's Day let's relax and reflect on the joy of it all. A hug and kind words, perhaps a kind deed are welcome rewards for our important job! Well...perhaps a few flowers. What does stewardship mean to you? How can we help our children develop an awareness of our relationships with our natural world? Executive Director of the Santa Cruz Museum of Natural History, Heather Moffat McCoy, ponders this question and invites us to learn more. Santa Cruz Children's School's eldest students (4th-6th grade) will be performing their SCCS TED-Ed Talks at UCSC in Marine Sciences B206. The lineup includes multimedia presentations on such diverse concepts as apitherapy, the science behind smiles, what's really in your neighbor's fast food, self-driving cars, black holes, rabies, intriguing international borders, slime, the ramifications of privatized fishing, can we live on Mars, the science behind mythconceptions, and whether you can even be sure that you exist! In addition to the talks at this FREE event, there will be hands-on science activities for all ages as well as food. Please join us and support the next generation of scientists with your sense of wonder. When we talk about engaging in stewardship of the natural world, we might be tempted to think of nature as it exists today. But the one sure thing about nature is that it is always changing-adapting to its own forces as well as those contributed by human factors. For many, the defining motivation behind stewardship is the desire to act in the present to positively impact the future-thinking about how actions we take now can improve conditions in nature. As our natural resources respond-positively and negatively-to our actions, we must wonder what "nature" will look like to future generations who have never had the chance to see the Great Barrier Reef, an old-growth redwood forest, or a flock of snowy plovers. Will we be able to preserve critical species and habitats, and with what tools and resources? What role can we play individually to preserve something that is meaningful to us? 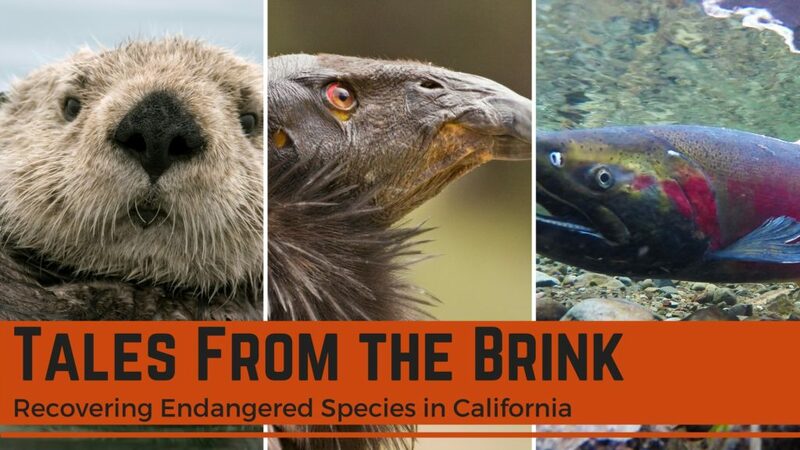 On May 17, Santa Cruz Museum of Natural History will host the next installment of our bi-annual Rio Theatre Speaker Series with a panel discussing "Tales from the Brink: Recovering Endangered Species in California." Moderated by California's Secretary of Natural Resources John Laird, the presentation will feature status updates by three scientific experts on the California Condor, Southern Sea Otter and Salmonids -all currently listed under the Endangered Species Act. The panel will explore how everyone from policymakers, researchers and individual community scientists on the Central Coast has a part in pulling these populations back from the brink of extinction. Secretary Laird, a former Assembly member and Santa Cruz mayor, will provide a larger context about the status of species protection in California. I hope you will join us for what promises to be an engaging, informative program. In this topsy-turvy world of ours it appears that certain traditions are fading, being replaced or even revived! For example, "Everyone should go to college" is no longer de rigueur. Entering the trades is being touted as a respectable, viable and even wise choice for some. Graduating with a college degree and a heavy debt load is being questioned as a good start as an adult. Long a tradition of European education options, and once an important part of training in the USA, apprenticeships are returning to vogue. I'm delighted to see sensibility and respect for different paths entering the picture. As well as nurturing natural talents and interests, we need to think very carefully about how to guide our children in their post high school paths, to do lots of reading, to explore options. Most of all include them in exploring options and making decisions from babyhood into fledgling adult. It's our job because we know our children better than anyone else. America rarely uses an apprenticeship model to teach young people a trade. Could such a system help the unemployed?At last, unemployment is easing. But the latest low rate-hovering below 6 percent-obscures a deeper, longer-term problem: "skills mismatches" in the labor force, which will only worsen in years to come. According to the most recent figures, 9.3 million Americans are unemployed, but 4.8 million jobs stand empty because employers can't find people to fill them. With new technology transforming work across a range of sectors, more and more businesses are struggling to find workers with the skills to man new machines and manage new processes. May 17. 7 - 9 pm. Looking out at the Monterey Bay you are likely to see the floating tops of kelp and the furry face of a sea otter (or a few). Now, as their population size reaches record highs, it may be hard to believe that 100 years ago there were only a few dozen individuals. The Endangered Species Act was established in 1973 to protect species at risk of extinction as a "consequence of economic growth and development untempered by adequate concern and conservation." Every endangered species faces a unique set of threats and challenges: hunting, poisoning, habitat loss, and even competing with humans for resources. For each dwindling population, the road to recovery involves the hard work of policy-makers, scientists, conservation groups and individuals working together to better understand, restore, and protect endangered species. click to view website Happy Mom's Day!